I was hoping to improve primarily antenna rx performance and in particular noise levels. Yeah, loops are the way to go then. I live on a block that is insanely close to a 'crossroads' of three overhead power lines. 160m and 80m are pretty much useless to me. For 40m and 20m I have put up full-wave loop antennas, about 10m (30ft) above ground. It gives me a chance to work some dx. Loops are not as loud as a dipole but the SNR is just much better. Congrats on your VNA purchase. They're a little pricey but it gives you so much insight into what is happening. The sign of the reactance, nice frequency sweep graphs, all at your finger tips. I'm impressed they go up to 3GHz. I don't have one myself but a fellow ham is often happy to help me out with his VNWA-3 from SDR-kits. I did take it seriously as small tweaks can sometimes have significant implications. "hey, wouldn't it be cool if the lacquer would be purple!!?". It would be odd if pcb manufacturers didn't think of this, but I did get a reply back from OSH Park yesterday. The mask web is the minimum amount of web that should be left between pads or traces of exposed copper on the top or bottom of the board. This is mostly relevant between the pins of parts with small packages. The mask thickness of 1mil is the vertical thickness of the mask between the air and the copper or substrate below it. We don't have the dieletric of the purple mask at hand, but we get a lot of folks ordering RF-capable boards and it seems like the mask dieletric is such a small adjustment to the substrate dieletric constant that it can safely be ignored. As you know I've been getting huge improvements using a l/2 dipole over a l/4 wire over ground (https://lowpowerlab.com/forum/index.php/topic,1389.msg13730.html#msg13730). 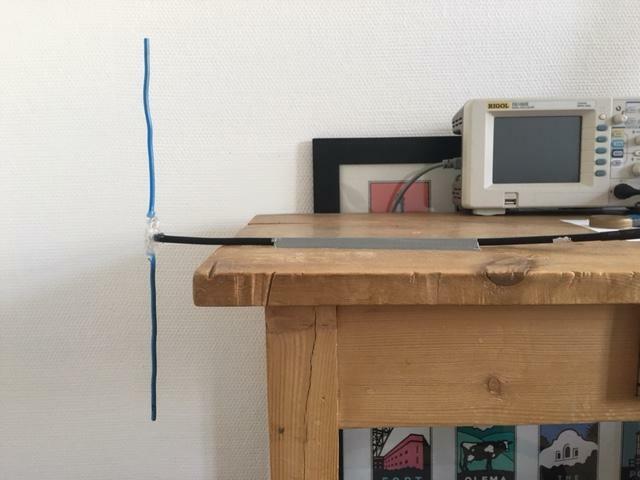 I built this antenna just using 2x 17.3mm wire, no tuning. Well now that I'm the proud owner of a minivna tiny I build a new one starting with slightly too long wires and the clipping to get the resonance right onto 433 Mhz. I ended up with 30.8cm length - quite a bit shorter than the theoretical numbers. This is likely due to the wire insulation I kept on the antenna wires. This new dipole receives around 9 dBm higher RSSI levels than the old one. Which was already so much (16 dBm) better than the wire antenna. Speaking from an antenna perspective we (or certainly I) have really been living in the stone age. I assume you use this with your own tiny nodes? Did you try this on a Moteino? I thought maybe you are using it for buried nodes or a gateway node. But perhaps I totally forgot you are using a esp gateway. I thought maybe you are using it for buried nodes or a gateway node. Buried nodes are special because the changing moisture content of the soil causes wavelength to change very drastically. So an underground antenna needs to be very wide-band. I have a couple of ideas there but nothing actually tried out yet. But yeah, I think for the gateway dipoles are a great option. Having a big and efficient antenna at the gateway gives you more room to compromise on space or otherwise constrained motes. Hi Joe, My Moteinos are all in the 915-Mhz band. 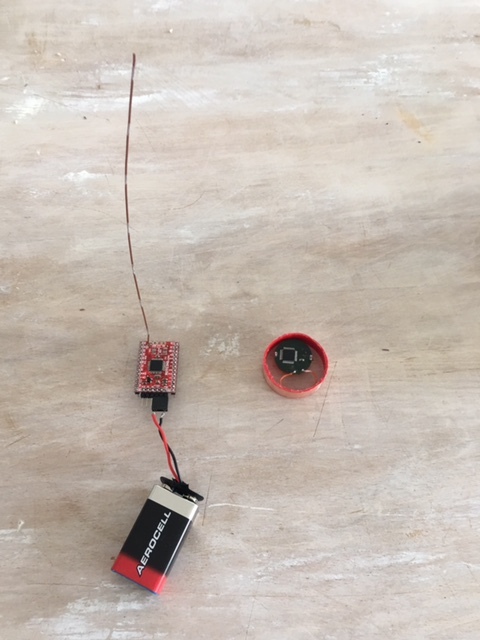 I investigated loop antennas but quickly got discouraged because of the small physical size and measurement accuracy needed to construct the antenna. In addition, I suspected that the tiny capacitance value required to tune the antenna would be very difficult to maintain since it is sensitive to objects in the local environment. However, your experience at 433-Mhz is causing me to re-examine the issue. I suspect it may be feasible to isolate the tuning cap is such a way that the loop its self could be sealed against moisture. If this idea works as expected, then buried Moteinos would be able to provide normal range and signal level using magnetic loop antennas. I'm going to need some 433-Mhz Moteinos just so I can play around with them. Great to read you're seeing such an improvement. Speaking from an antenna perspective we (or certainly I) have really been living in the stone age. Looks like the VNA has opened your eyes..
What length and type of feedline are you using? If this idea works as expected, then buried Moteinos would be able to provide normal range and signal level using magnetic loop antennas. I think that's an excellent point and one I hadn't considered. In a small loop the only part affected by the varying permittivity of the soil is the capacitor. If that is fully shielded eg by copper tape one could indeed end up with a narrow-band antenna that works independent of the dielectric properties of the immediate environment. I'm particularly excited about this as all the efficient wide-band antennas I've studied require a prohibitively large antenna at 433 MHz. I had already resigned to use 868 MHz for that very reason - hardly a good idea otherwise because of the much larger signal attenuation in soil at higher frequencies. I'm using coax, maybe 30cm. Since I don't use a balun the feedline will modify the antenna characteristics so I've measured it with feedline. I'm using coax, maybe 30cm. Reason I'm asking is that this is probably the right time and place to insert a little something about (coax) feedline lengths and how they can pick up radiation from the antenna. Maybe not so much for those in this thread but for everyone else who has questions about how to connect the antenna to the radio this may be of interest. For those unfamiliar with the relationship between feedline length and how it picks up radiation from the antenna, here's an example that relates to the above dipole antenna. Apart from the coax' internal dielectric, velocity factor and standing wave ratio, what can become an issue is a phenomenon called 'RF in the shack', relating to 'hot' radio equipment and feedlines that will act as an extension of the radiating antenna and can cause all sorts of nasties (resetting microcontrollers, chip memory corruption, component failure, etc..). The main reason these 'common mode' currents appear is because of asymmetry of the antenna and using a length of feedline that is resonant at the frequency of operation. In this case it's not so much the internal dielectric that's responsible for determining how long one physical wavelength in coax is for picking up antenna currents, but the outside braid and its surrounding insulation material. I think I've seen between 0.80 and 0.95 as a velocity factors. The Moteino is equipped with a rfm69hw, the th mote with a rfm69w. I set both to full power and measured RSSI values at the receiver (an espgw with dipole antenna). Thus I was transmitting with 7dBm more power on the Moteino than the loop. Not surprisingly RSSI values in the same room with the receiver differed drastically by orientation reflecting the linear polarization of both antennas in perpendicular directions. But starting in the next room there wasn't much difference between the orientations. Overall the Moteino produced RSSI values between 9dBm and 3dBm better than the loop, depending on the orientation of the Moteino (rotation in its main plane) and inline with the 7dBm higher tx power. The loop produced very omnidirectional radiation across rotations around its axis. From this data the loop performed just a bit better than the moteino with less variation - much better than my first attempt and pretty respectable given the form factor. That's not to say one can be content with these results as the dipole measurements have shown that significant gains can be had over the monopole over insufficient ground plane approach. If that is fully shielded eg by copper tape one could indeed end up with a narrow-band antenna that works independent of the dielectric properties of the immediate environment. Today while measuring the new antenna I introduced "hand effect" by positioning my hand right next to the capacitor. Interestingly there was absolutely no effect on frequency, but some decrease in return loss and broadening in bandwidth. I'm not sure but it felt like this antenna was more robust against influences from the environment than the first one. Which might well be due to its smaller size and thus more magnetic nature. I built a new loop antenna today, with a diameter of 3.5cm. Pretty good that it can fit inside a 1.5" PVC pipe (I can use it on my Stream Level sensor, maybe my Landscape lights, and one other landscape related item but I can't remember what it is...). Now, can you get it to 3cm so I can put it on the wall with the rest of my art work? By the way, what's that thing hanging off of the Moteino? It doesn't look like any coin cell I've ever seen! How essential is the vna turning out to be?